There are so many different types of walkie-talkies that it can be hard to know where to begin when searching for the perfect one. There are many features that enhance the capabilities of various walkie-talkies, but being waterproof is high on the list of most desired features. 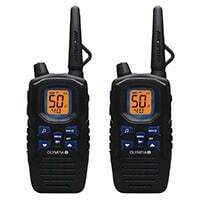 Whether you are using the walkie-talkies while camping and hiking or need them to communicate with friends on a beach vacation, having a waterproof radio device gives you one less thing to worry about while you are out having fun with friends and family. With so many different waterproof radios, how do you know which one to buy? We have taken the guesswork out of it for you by reviewing the best waterproof walkie-talkies for you. There are many amazing walkie-talkies available. But if you are looking for a good waterproof walkie-talkie then this guide will help you find the perfect model for you, which is not only able to last long but also has other great features. The Motorola name has long been synonymous with outstanding products in the world of two-way radio communication, and the Motorola MS355R is no exception. 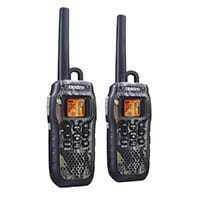 With features such as rechargeable batteries, NOAA weather emergency channels, and long range, the Motorola MS355R stands out from the crowd in any outdoor situation. The Motorola MS355R ranks high in waterproof and floating ability, and it is able to withstand being completely submerged in one meter of water for up to 30 minutes without any issues. In addition to being waterproof, this versatile walkie-talkie set boasts up to a 35 mile range in ideal conditions. With its built-in repeater function, the Motorola MS355R works in conjunction with local repeater stations to carry your signal across even greater distances, ensuring that you will be able to stay in touch with your buddies. When purchasing this walkie-talkie you will get a number of extras that add to the value of the Motorola MS355R, including belt clips, PTT earbuds, battery chargers and adapters, and an in-depth user guide. Another great waterproof walkie-talkie is the Cobra CXT 1035R. An excellent choice for the serious adventurers, this rugged walkie-talkie can stand up to extreme conditions and environments. The Cobra CXT 1035R boasts an IP7 w﻿﻿﻿aterproof rating allowing for protection from submersion in up to one meter of water. This walkie-talkie is also designed to float when dropped into water, giving it an extra level of protective capabilities. Offering 2,662 channel combinations and a range of 37 miles, this Cobra walkie-talkie provides extended range and interference reduction in the harshest of terrains. As with the other radios reviewed, this walkie-talkie has NOAA alerts but offers the added security of weather alerts being sent to you automatically without the need for you to be tuned into a specific channel. You’ll never miss a call from your group again with the Rewind-Say-Again replay recording feature of the Cobra CXT 1035R! This feature automatically records the last 20 seconds of incoming radio audio, allowing you to playback and listen to the last communications from your group. Additionally, this walkie-talkie features VOX voice-activated transmission capabilities so you can communicate to others with ease. The company Olympia is known around the globe for producing high quality communication devices. If you want a good waterproof walkie-talkie then you should definitely check out the Olympia R300. This device comes with a tough body which is not only water resistant but is designed to resist dust as well and can last long due to its durable built. The walkie-talkie is able to communicate over a range of 40 miles and provides crystal clear communication even in harsh conditions where many other devices fail to function. The Olympia R300 also receives NOAA alerts and comes with LED flashlight. With a great battery life, good range and a durable body, the Olympia R300 is a great choice for walkie-talkies and you should definitely check this amazing device out. 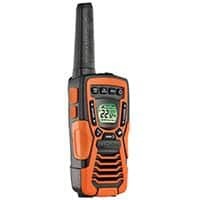 Another walkie-talkie that should be considered when talking about the best waterproof walkie-talkie is the Uniden GMR2875. This submersible, floating walkie-talkie set from Uniden is one of the elites of the waterproof walkie-talkie industry. Able to float in water, this Uniden walkie-talkie is ideal for any adventure you can imagine. This Uniden walkie-talkie also features direct call and caller ID which allows you to contact one member of your party privately without interfering with group communication. 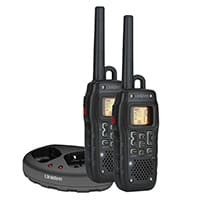 The Uniden GMR2875 has a range of up to 28 miles, making it the ideal choice for long-distance communication when hiking, boating, and fishing. Able to access 22 channels and several NOAA weather information channels, you can feel safe knowing that you will be well informed in case of an emergency with this walkie-talkie. If you are looking for a great waterproof device, then you should also check out the Uniden GMR6000. This walkie-talkie is not only waterproof but it also has a good range and can allow you to communicate over a vast distance. This device also claims to be weather resistant and is able to float in water in case you drop it in water. The Uniden GMR6000 has a compact design and is extremely lightweight making it perfect for those long trips where you do not want to carry heavy items around with you. But being lightweight doesn’t mean it’s not durable. The body is designed to withstand all kinds of conditions. What’s more is that you can strap this walkie-talkie to your belt and take it with you everywhere you go. With all these amazing features and more, the Uniden GMR6000 is definitely worth checking out. There are many factors that you need to think about before you set out to buy the perfect walkie-talkie for yourself. While there are some great waterproof walkie-talkies available on the market, other features such as their range and performance also need to be considered when buying a new device. 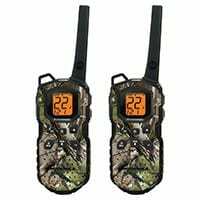 There are some great walkie-talkies that allow you to communicate over a large distance. These walkie-talkies are more powerful and also require some strong batteries to operate them. You should look for a walkie-talkie that will cover the range you will need it for. The battery life needs to be long enough so that you can take a long trip without having to worry about charging your device. If you are fan of hiking, camping and other adventurous activities you should look for a walkie-talkie that is not only waterproof but also comes with rechargeable batteries. The body of the walkie-talkie doesn’t only need to be waterproof but if you want it to last long you should look for a device that has a strong exterior that doesn’t break easily. There are walkie-talkies made with hard exterior body and that’s what you should invest in. There are many features to take into consideration when purchasing a walkie-talkie with the ability to stand up to rugged outdoor environments. A wide variety of waterproof walkie-talkies are available, and the market continues to evolve and expand in the technology and durability of the products offered. All of the walkie-talkies we reviewed are rated highly and can withstand submersion in up to one meter of water. You can’t go wrong when purchasing one of these top-rated walkie-talkies, and researching the different features allows you to pick the best device for your needs.